Motor vehicle accidents can leave people in Duluth, Minnesota, facing numerous challenges. Our attorneys at the law firm of Falsani, Balmer, Peterson & Balmer understand what those injured by the negligent or reckless actions of another are going through. Providing dedicated advocacy, we help clients in the Duluth area, as well as throughout the areas of Forest Lake, Minnesota, and Superior, Wisconsin, to pursue financial compensation for losses, including medical bills, lost wages, and pain and suffering. Since 1975, our personal injury law firm has aided individuals and families to achieve financial justice. We have helped clients obtain favorable awards and settlements in injury cases, including car and truck accidents, bike accidents, animal bites and premises liability. Standing by those we represent from a free initial consultation until their legal issues are resolved, our team strives to ensure they are on equal footing in their pursuit to recover the maximum damages. For our clients' convenience, we accept credit cards. Never taking a cookie cutter approach, we tailor our strategies based on each client's unique situations and needs. Our attorneys thoroughly review the extent of people's injuries, as well as the circumstances of their accidents, exhausting every path toward the best possible solution to their legal problems. Whether negotiating with the insurance companies or with those responsible for causing our clients' injuries and their legal representatives, or arguing their case at trial, we remain focused on our clients' interests. 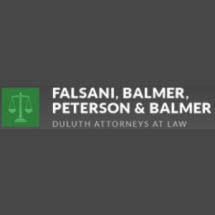 In addition to offering personal injury representation, our attorneys at the law firm of Falsani, Balmer, Peterson & Balmer also aid people who have been injured on the job. Guiding clients through the workers' compensation claims process, we strive to help them receive the benefits they deserve.